(AP Photo/Sue Ogrocki, File) In this June 12, 2003, photo, the Rev. Billy Graham preaches in Oklahoma City, Okla. Graham, who died Wednesday, Feb. 21, 2018, at his home in North Carolina's mountains at age 99, reached hundreds of millions of listeners around the world with his rallies and his pioneering use of television. — Billy Graham in an interview with Religion News Service in 1994 about how he is bothered “a little bit” by people who called him a name-dropper. 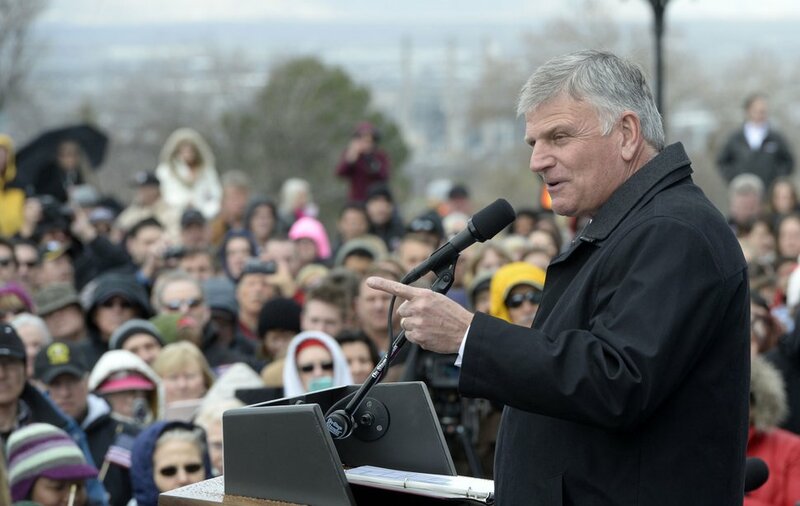 Al Hartmann | The Salt Lake Tribune Thousands gathered on the steps of the Utah Capitol on March 29 to listen and pray with Franklin Graham, son of evangelist Billy Graham.